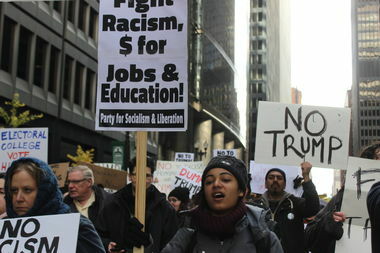 Activist groups are gathering at U. of C. Thursday to prep for protests on inauguration day. HYDE PARK — The University of Chicago groups are spending Thursday getting students pumped up and educated before expected protests on campus and across the city during Donald Trump's inauguration as president on Friday. The university’s Center for the Study of Race, Politics and Culture and the Center for the Study of Gender and Sexuality are hosting "Re:Action," an activism fair, book exchange and free workshop series, starting at 2 p.m. Thursday on campus at Ida Noyes Hall, 1212 E. 59th St. The event starts with an open fair where people can connect with 40 organizations on issues they care about or stop by the book exchange to trade titles on radical politics, theory and history. A mixer for activists will follow from 6-8 p.m.
A full schedule is available online.